Aberdeen have been unsuccessful with their appeal against Jonny Hayes' sending off in Saturday's 2-1 victory over Celtic. With 18 minutes remaining at Pittodrie and with the score at 1-1, the winger was given a straight red card for a challenge on defender Mikael Lustig. A Scottish FA disciplinary tribunal reviewed the case and rejected the claim of wrongful dismissal. Hayes will now serve a two-match suspension. The appeal process meant the 28-year-old Irishman was free to play in Tuesday's 1-0 win over Hamilton, which took the Dons five points clear at the top of the Premiership. However, he will miss Saturday's visit to Hearts and the following midweek League Cup meeting with Hibernian. 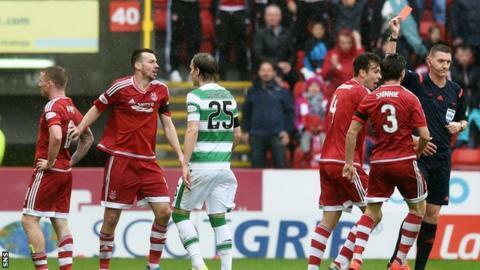 Speaking after the win against Celtic, Aberdeen manager Derek McInnes thought the red card was harsh. "It's not a two-footed challenge," he told BBC Scotland. "If he [referee Craig Thomson] sees again, I'd be surprised if he thought it was a red card but it is what it is. We had to deal with it and we dealt with it."